Last Saturday a number of my constituents attended the march in London for a second Brexit referendum. I appreciate that they feel strongly about the issue, and they want me to side with them. On the other hand, I have received a few e-mails from constituents who urge me to “chuck Chequers” and the Prime Minister, too. I am sorry to disappoint both sides, but my position remains as I set out in my general election address in 2017. I said that the referendum result should be respected and that we should achieve the optimal new arrangements for Britain, guided not by ideology but what is in the national interest. I warned that we had a difficult negotiation ahead and that we would need the maximum access to Europe’s market to protect jobs and investment. We now face the most challenging moment in the negotiations and I believe this is a time to unite behind the Prime Minister and allow her to lead. I feel strongly that those who cannot stop criticising her are doing the country a disservice. The Prime Minister is entitled to loyalty from her own team and I for one am tired of listening to a minority of politicians from either extreme of the argument who cannot stop sniping. Some of the language used to criticise the Prime Minister in anonymous briefings has been appalling. 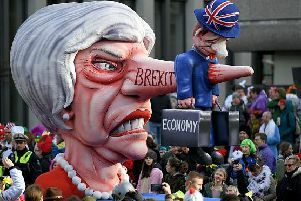 However, I suspect that Theresa May has a great deal more quiet support within the Conservative Party and in the country at large than the media reports. Europe’s politicians have united behind the EU’s chief negotiator, Michel Barnier, strengthening his hand. By contrast, both pro and anti-Brexit British politicians have gone to whisper in the ear of Brussels’ negotiators, which can only undermine our country. The Arundel & South Downs constituency split 50:50 in the referendum. As in the country as a whole, opinion was divided. Despite the wish of Saturday’s marchers, there is little evidence that views have changed significantly in either direction. While some people have especially strong pro- or anti-Brexit views, I suspect most take the view that the country spoke in the referendum, and however we all voted we should just get on with it. But how we leave really matters. At a vital moment for our country, this is a time for calm judgement and quiet resolve.